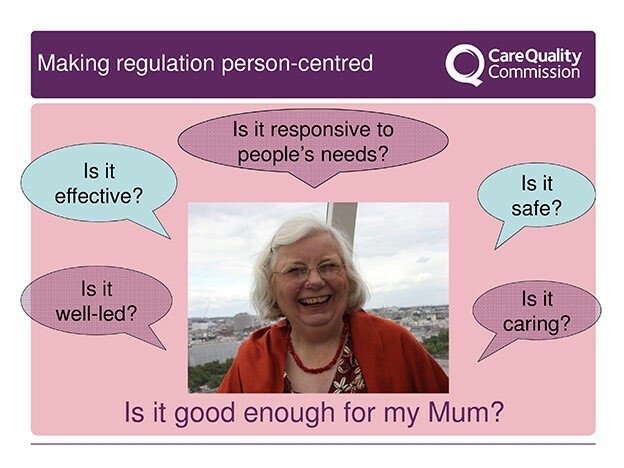 This was rapidly popularised as The Mum Test, probably assisted by my use of a photograph of my Mum in presentations about our new approach to illustrate the point! The photo was taken on my wedding day, and as it had taken me nearly 17 years to persuade my husband to marry me, she was looking pretty happy! I have had a few challenges about the Mum Test. Challenge one: it’s not original. Lots of people have told me that they have used a similar yardstick when they have inspected, commissioned or provided services. To be honest, I wasn’t trying to be original and we all know some of our best ideas are stolen from other people. What I do think gives it a new twist is someone in my position using that simple concept to reinforce the importance of putting people using services at the centre of what we do as regulators and inspectors. Challenge two: it reinforces the stereotype that adult social care is just about older people. I think that is a fair challenge, but in my defence my original statement did refer to any other member of my family too! While the majority of services we regulate in adult social care are provided for older people, we also have regulatory responsibility for services for people with learning disabilities, physical disabilities and mental health problems as well as other specialist services, including hospices. So it is really important that we recognise that the Mum Test isn’t to be taken literally but as an indication that we want our focus to be on the person using the service, whoever she or he may be. Challenge three: what about people who don’t have a Mum? This was a new challenge to me last week from a member of staff and it really made me stop and think. The member of staff explained that when the Mum Test is mentioned it made her think of her mother who is dead and caused her much sadness. I have to confess this didn’t just make me think, it made me feel really sad too. I responded by saying that I usually try to expand the Mum Test by saying it’s not just about Mums, it is really about anyone we love and care for, which of course could be ourselves too. But this comment has reinforced for me the need to be even more sensitive in acknowledging that the Mum Test may not work for everyone — it’s the spirit of it that’s important, i.e. 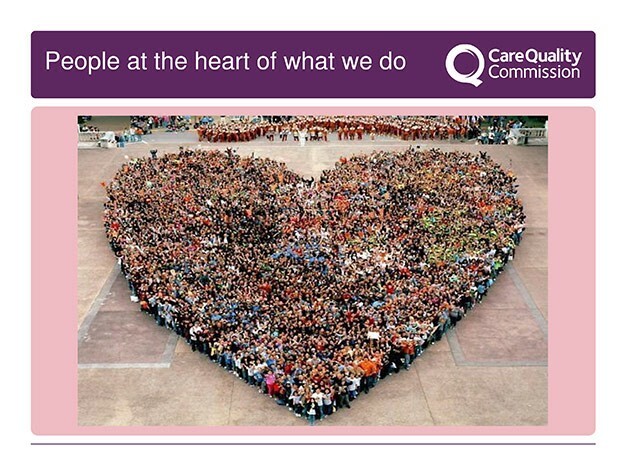 it is about the people using services and putting them at the heart of what we do. So given all of those challenges, is the Mum Test here to stay? I think so. It has tremendous resonance for many people and demonstrates that CQC does want to make regulation and inspection truly person-centred. But if we are also to meet the challenge of personalisation, then we need to be thinking about the people who are using the service — what are their needs, aspirations and desires? And making sure that we ask them what they think about the service they receive and if they cannot tell us, finding out in other ways. At the end of the day, that’s got to be the real focus.